As a chapter slowly comes to an end, another one begins. The most monumental things happened to me during this first decade of the millenium-- I finished elementary school, middle school, entered high school, I got my driver's license, graduated from high school, had my first job, started college, witnessed my sister getting married and having her first child, and met people who will hopefully be friends for a lifetime. And this Friday, December 31st, I get to see my brother start a whole new chapter of his life with his wife-to-be. Looking back on the last 10 years, there were plenty of ups and downs, but the ups further outweigh the downs. And if all of this happened already, I can't wait to see what will happen the next ten years-- graduating college, starting grad school, welcoming future nieces & nephews, meeting someone special, traveling the world, and whatever life will take me. 2011, I think you're going to be the start of a great decade. I think it's funny when guys try to pick up girls. Quite often it fails, but sometimes it does work. But in this particular case, the poor guy failed. I went to dinner with a couple of friends this weekend and there was this guy that kept checking out my friend as she was trying to park her car. I mean, he was still checking her out as we parked, got out of the car, and left. We came back a few hours later, and he left a note with his phone number on her car. 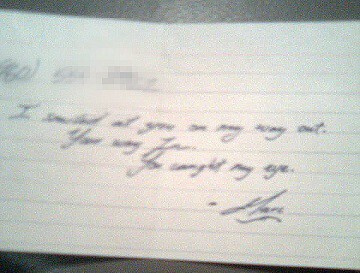 The picture's pretty blurry, so here's what it says: "I smiled at you on my way out, your way in. You caught my eye." -Marc. Oh Marc... did you really think she would even call you? But good try, buddy. Good effort.